Windows 10 brings back the Start menu people know and love, while enabling them to easily find their files, pinned applications and favorites. More secure than ever, Windows 10 includes Windows Hello, Microsoft Passport and Windows Defender for anti-malware protection, and a commitment to deliver free ongoing security updates for the supported lifetime of the device. Optimized for both keyboard and touch, the Windows 10 upgrade is designed to be compatible with Windows devices and applications. Windows 10 adapts to people for a more personal experience. Cortana, the world’s first truly personal digital assistant, helps people get things done across all their devices. Cortana learns individual preferences to provide relevant recommendations, fast access to information and important reminders via talking or typing. Windows Hello greets people by name and lets them log in to their PC without a password — providing instant, more secure access to their Windows 10 devices through biometric authentication. Windows 10 also lets people interact with their device via the traditional mouse and keyboard, or through more natural ways such as voice, pen or gesture. In addition to the Office 2016 full featured desktop suite, 4 new Universal Windows applications for Word, Excel, PowerPoint, and Outlook will offer a consistent, touch-first experience across a range of devices. Designed from the ground up to run on Windows 10 and perfect for staying productive on the go, people can easily create and edit Word documents, and deliver PowerPoint presentations while annotating on the fly. With new touch-first controls in Excel, people can create or update spreadsheets without a keyboard or mouse. 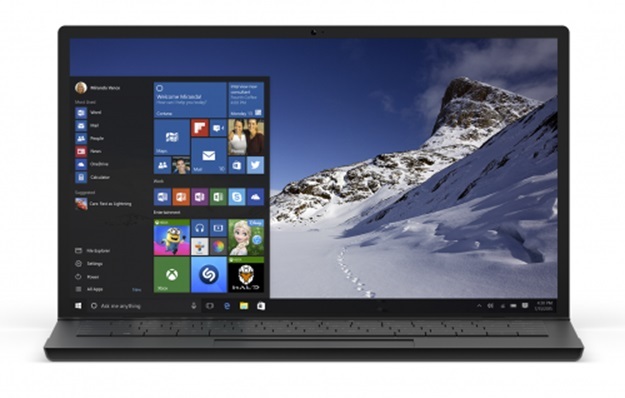 Windows 10 offers a familiar and consistent experience across devices. Continuum enables devices to transform, enabling elegant transitions of a tablet into a PC, and back — and for a Windows phone to become like a PC. Xbox on Windows 10 brings the expansive Xbox Live gaming network to both Windows 10 PCs and tablets. People can communicate with their friends on Windows 10 PCs and Xbox One while playing any PC game, and share content using Game DVR. People can also stream games directly from their Xbox One console to a Windows 10 tablet or PC in their homes. Games developed for DirectX 12 in Windows 10 will see improvements in speed, efficiency and graphics capability.